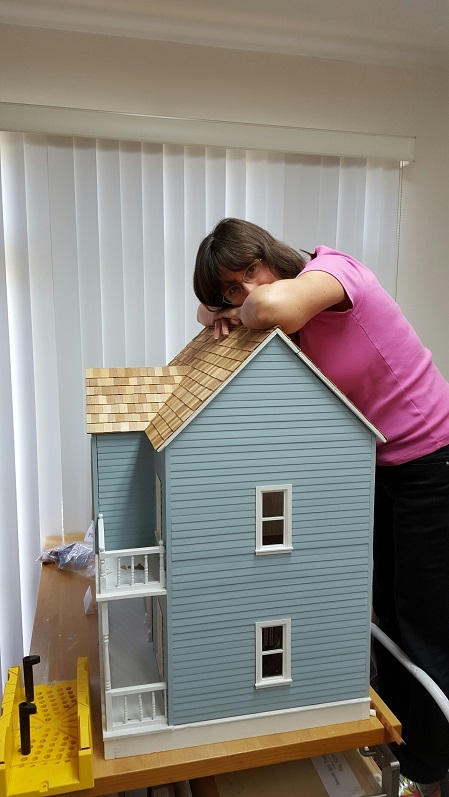 The 1978 Craft Publications Willoway dollhouse went home to it's owner! 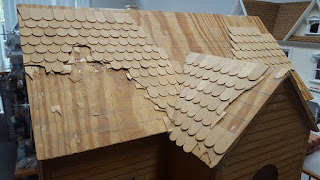 We were to do a full overhaul on it: remove all old fish scale shingles, fix up broken railings, reattach the back roof which had fallen off, paint everything, shingle the roof in new rectangular shingles, install wiring, coach lights, wallpapers, and flooring! 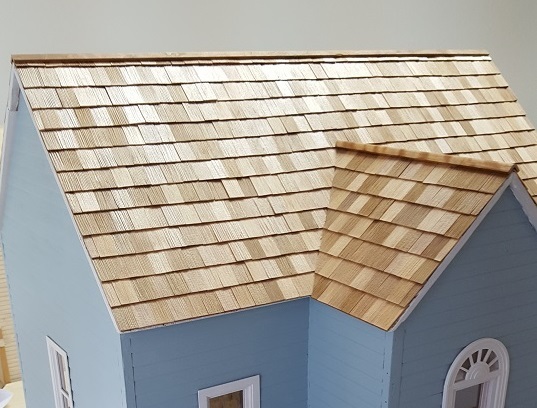 And although the porch was the biggest repair job on the exterior, the shingling efforts really improved the look of the house. 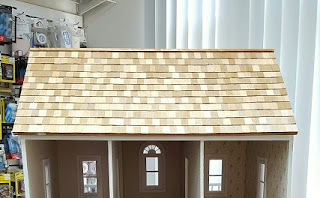 It is funny how a simple shape can change the look of a house: This house needed rectangular shingles! The fish scale shaped shingles were too whimsical or soft and did not give this house the presence it deserved. 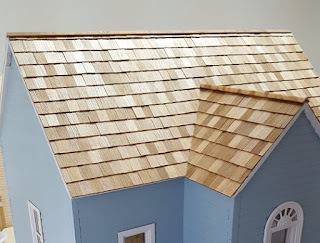 Although cute, those old shingles needed repair and the customer (or whoever had started the shingling) had shingled differently than I would have: I prefer the main roof to be shingled first and then the peak/dormers should be done. 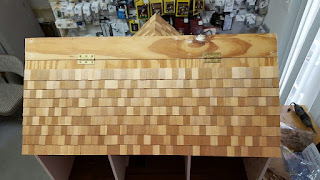 The customer picked rectangle shaped shingles to replace the old ones and I am so glad because I think it made the house look more impressive instead of "cutesy". Although it was looking a little rough, the bare bones were better than I anticipated given that the outer walls were merely constructed out of siding material (if you look closely at the photo above you can see the siding lines on the interior of the right wall)! 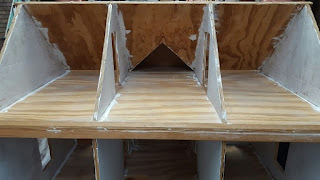 But the wood was dry and kept sucking up our primer -- several coats of KillZ was needed to fully seal the wood! 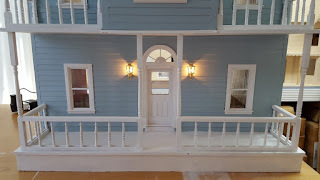 Room sizes were very nice but the haphazard priming job previously done was detracting from some finer details such as the crown molding all throughout the house which we did not fully notice until it was time to wire the house! 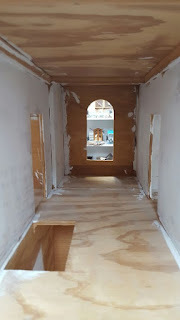 The only issues on the interior were the electrical (see our Electrical Issues here) and how difficult it was to wallpaper some of the long, narrow rooms (such as the hallway and center attic room). 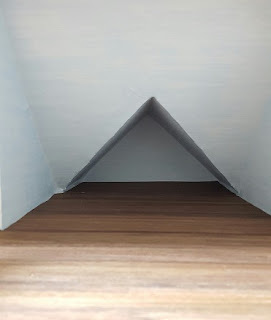 Luckily the customer picked a solid blue paper so I didn't have to fuss with a pattern when fitting it in to the small space! 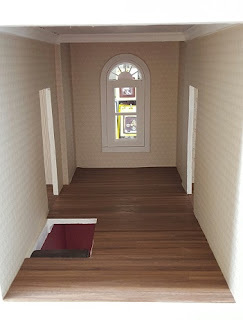 Flooring was no picnic to get in there either. 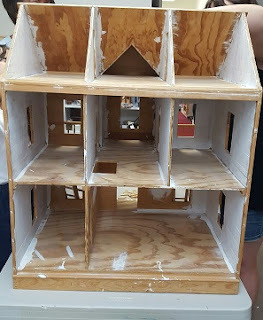 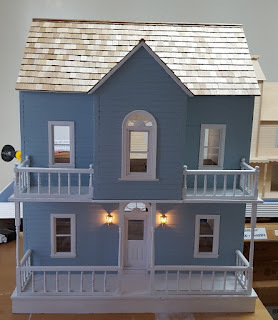 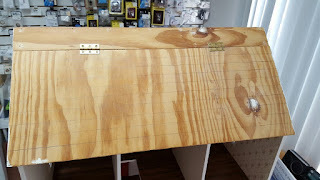 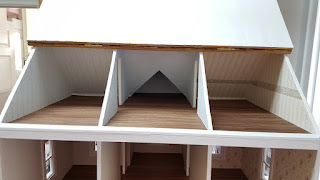 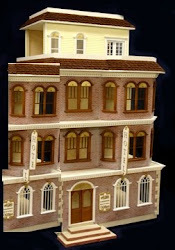 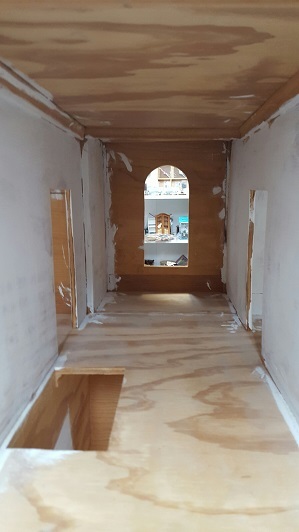 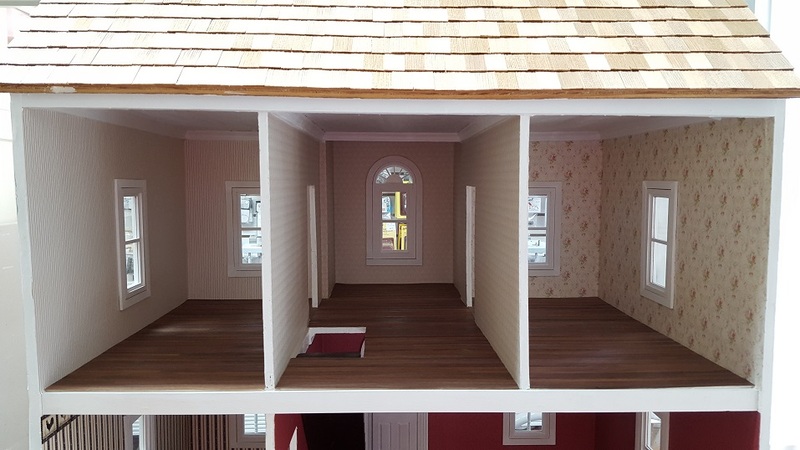 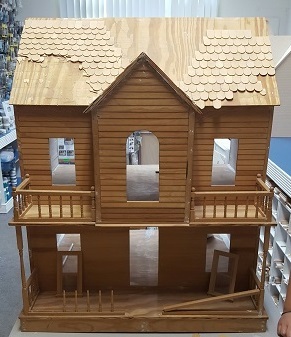 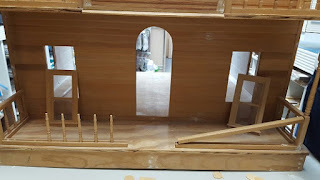 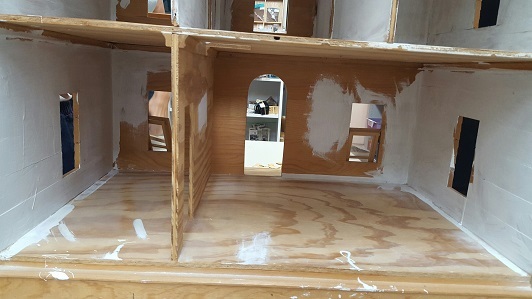 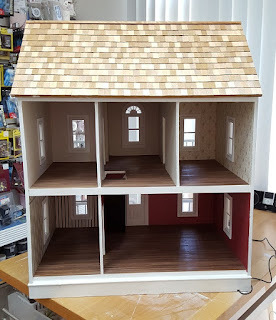 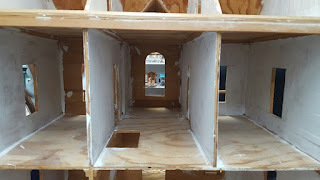 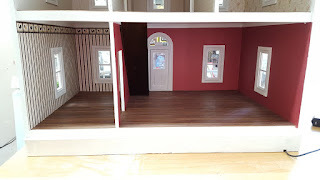 I was so excited to work on this dollhouse because I have always heard of the 1976 Craft Publications Pepperwood Dollhouse (have customers who still come into the store today that are building one from the plans they bought), but did not realize the company had produced many different dollhouse plans! 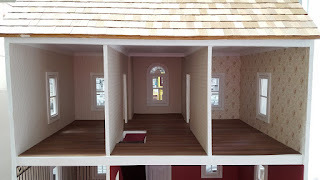 I could not find any information about the Craft Publications Inc company (other than it used to be in Georgia) but I did find that the designer of their dollhouse plans was Jacqueline Kerr Deiber (who also designed those beautiful 1920's Roper Stove, Monitor Top Refrigerator, and Maytag style Washing Machine!). 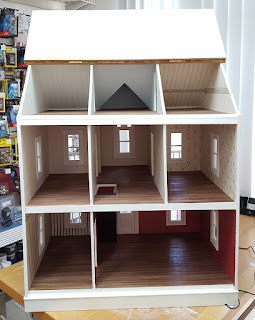 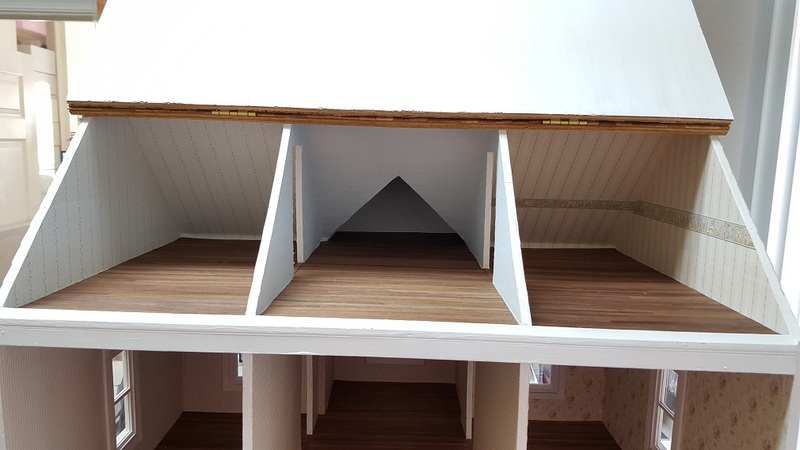 So this wonderful dollhouse has received some proper TLC and will continue on for another generation or two of fun! 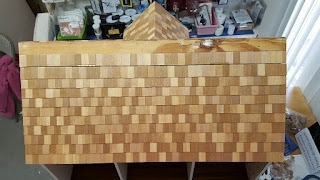 So, at the request of a friend I took photos as we shingled the back of the Willoway because my friend believes hinges and shingles are a very intimidating combo. 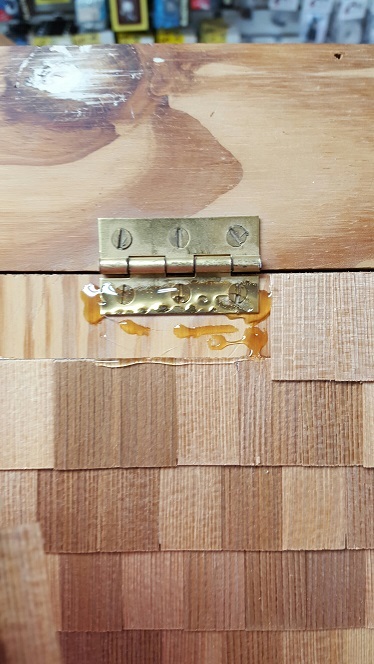 (I don't blame her - hinges frighten me too). 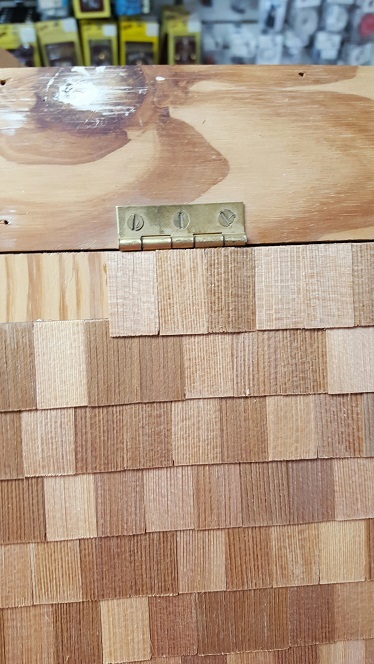 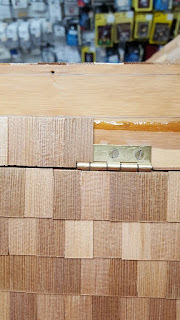 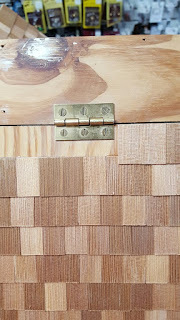 The most important part of shingling with a hinge is planning. 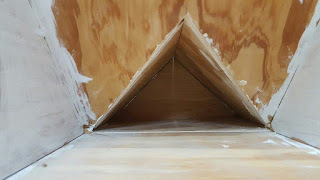 We measure and mark our lines as least a few times before settling on the proper pattern. 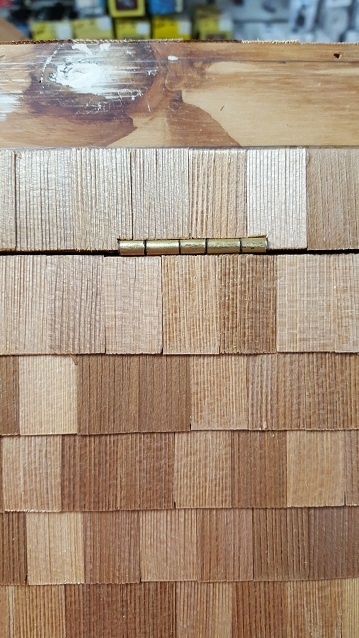 A proper pattern? 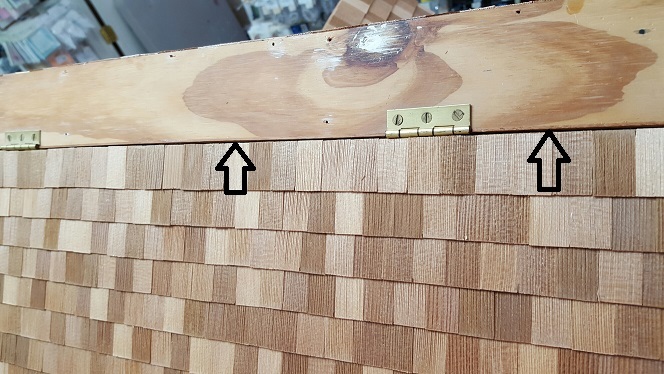 Yes, a proper pattern (come on now, that's just fun to say over and over. 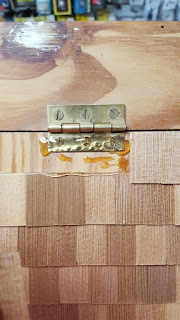 Or maybe that's just the glue fumes talking). 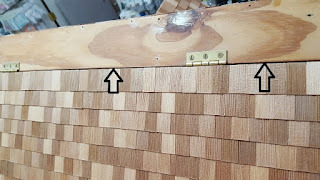 Next Up: Top Hinge Row! 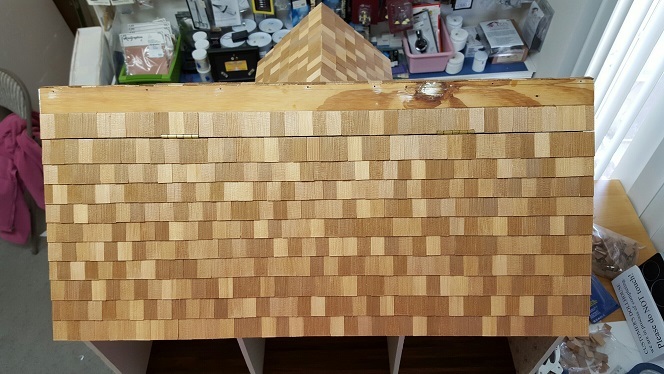 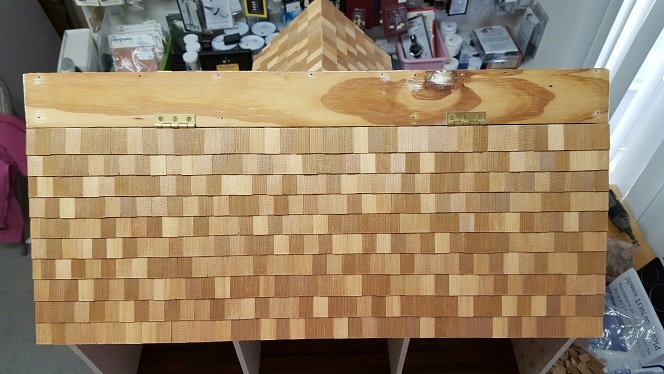 Then finish shingling the house and top it off with a roof cap (or a Boston Lap pattern at the ridge). Either glue fumes were getting to me or I just wanted an excuse to nap for a bit, but I needed some weight to hold down the roof cap while the glue dried: I only use the best tools here at work so I used myself! 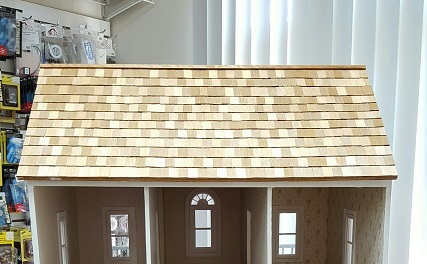 Roof is all done and house is ready to be picked up! 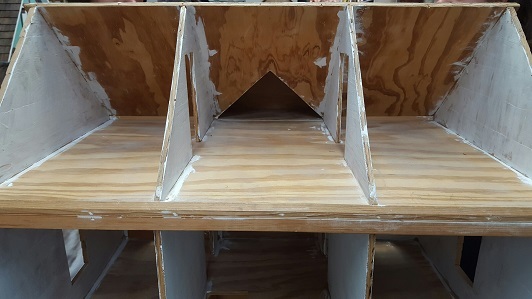 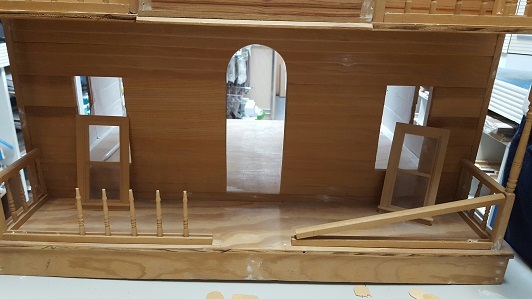 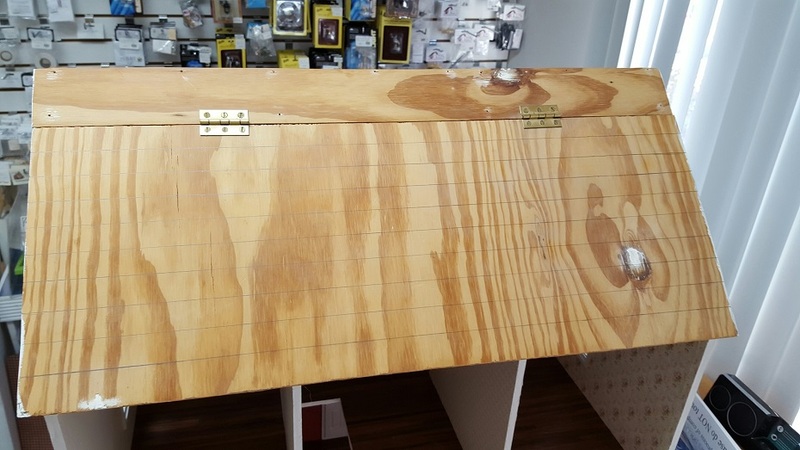 The final recap of this Willoway Dollhouse will be published tomorrow or Friday . . . . in the meantime, can you quickly spot the hinge? Hopefully the hinge blends in with the roof now.